"As margins continue to shrink due to decreased PBM reimbursements, vaccines are a good way to increase your business & profitability. It also helps add value to your patient base and can be a great tool to increase business in other areas as well as providing exposure to local physicians and businesses on other services that pharmacies can provide." ---Brandon Cooper, PharmD, Soo's Drug & Compounding Center and Co-owner of Soo's West End Pharmacy, Jonesboro Ark. Life-saving vaccines have a profound impact on the entire nation. Today, most everyone can receive immunizations against 17 once common and potentially deadly infectious diseases in the US. However, many patients still "fall through the cracks" because providers fail to ask about things such as traveling plans, school health needs, or if they have received immunizations at high-risk environments. As the emphasis on preventative care expands many states are expanding the role of the pharmacist as experts in immunization. 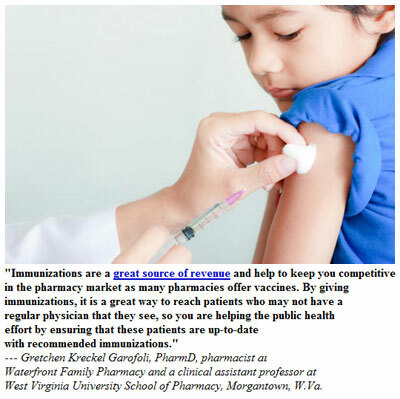 Patient immunization at a community pharmacy is so popular nowadays that the number one patient care service offered by community pharmacy is immunizations highlighting the important role pharmacists play in public health. In fact, 61% of community pharmacies offer immunizations. Offering vaccinations are great opportunities for pharmacies in ways other than the direct benefit of providing the service. Vaccinations also attract people to the store itself. For example, Forbes magazine featured a chain retail pharmacy that reported a 6% increase in sales from January 2012 to January 2013 as the result of a 25% increase in the number of flu shots administered. "I understand that starting an immunization program can seem overwhelming and certainly be stepping out of your comfort zone. But once you make the commitment, it is so easy." --- Tana Kaefer, PharmD, Clinical Coordinator for Bremo Pharmacies, Richmond, Va. The program reviews issues that pharmacists must consider before starting an immunization program, and focuses on practice implementation. Jump Start Your Immunization Practice With "The Pink Book"
(703) 838-2649 or the resources below.